A sinkhole is shown in Oxford, N.S. on Aug.27, 2018. 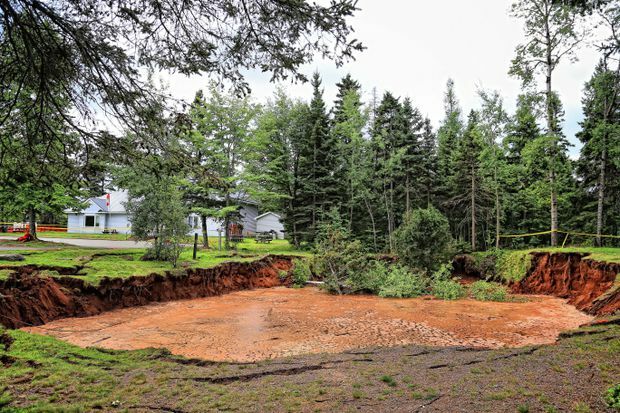 The unpredictable sinkhole that has swallowed trees and picnic tables in a Nova Scotia park is continuing to grow – and has now inspired a song. The park in Oxford, N.S., remains roped off while geologists and emergency officials assess the area around the muddy hole, last measured at 34 metres by 29 metres. The Town of Oxford issued an update on Wednesday, saying cracks in a nearby lot are still growing, though there was little activity in the hole compared with previous days. Town spokeswoman Linda Cloney confirmed that the hole has started “undercutting” the pavement of a nearby Lions Club parking lot, but she said the town is not planning to evacuate local businesses any time soon. “We always keep that on the back burner, but it’s nowhere near that,” said Cloney. Security remains on site to keep curious onlookers out of the park. The Nova Scotia RCMP is asking visitors to “be extra cautious” while driving in the area, and to respect the boundaries set up by city officials. Cloney said there have been a few fender benders in the area, a result of increased traffic from people hoping to catch a glimpse of the mysterious natural phenomenon that has become a bit of a tourist attraction. A new Twitter account, SinkholeOxford, is now offering observations from the perspective of the hungry sinkhole, musing about what it might consume next. The song raises questions about the fate of the Lions Club and where neighbourhood kids will play, after playground equipment was removed from the sinkhole’s possible path.